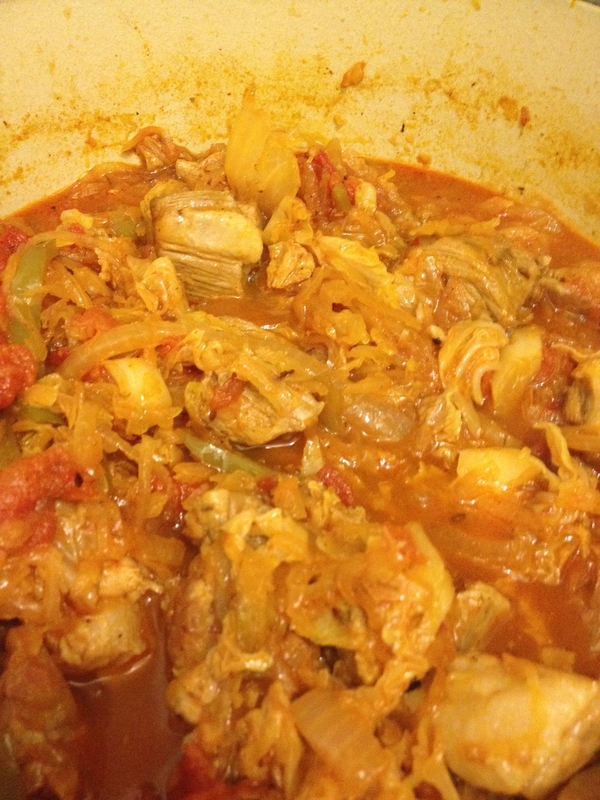 A couple of weeks ago I cooked a Romanian recipe. I figured I’d blog about it within a few days, but then we had that hurricane that you’ve heard me talk so much about and I kind of shifted my focus. This week I’m trying to get Back to Basics (a Christina Aguilera reference because I worship her like the Goddess she is and I’m so freaking excited that her new album came out today). One of the guests at the United Noshes dinner I attended a few weeks ago had spent time living in Romania and gave me one major piece of advice; they eat a ton of polenta. Well that was music to this carb loving girls years! 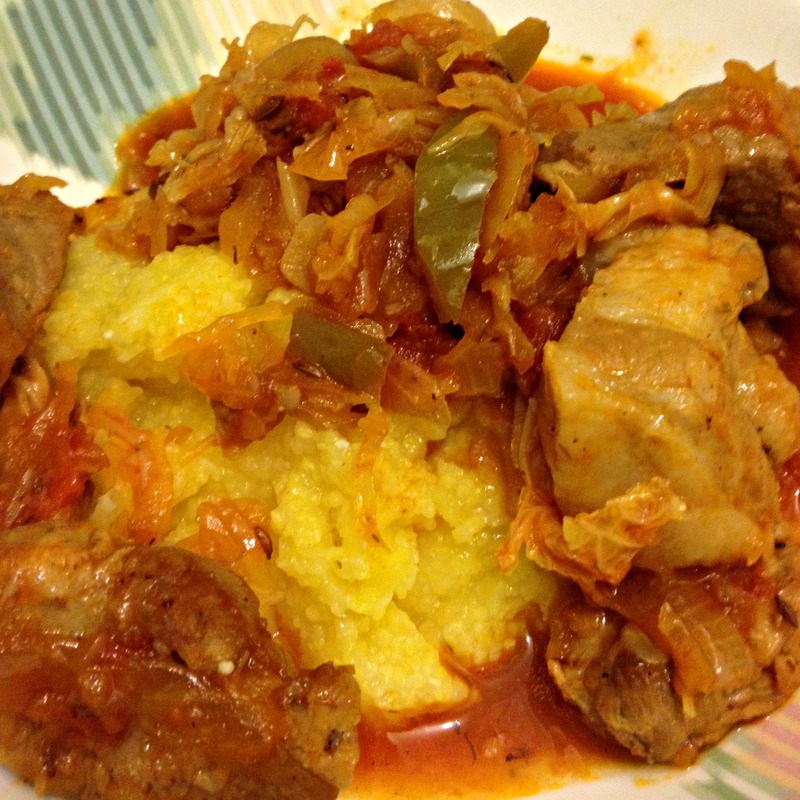 I had been thinking about making a soup, but I really wanted to gorge myself on enjoy some polenta (mămăligă in Romanian) so I chose to make Varza Cu Carne de Porc, a pork and cabbage dish. Polenta and veggies and pork, oh my! Heat oil in a large dutch oven over medium heat. Add pork and brown on all sides, working in batches if necessary. Remove pork from pot and set aside. Add onions and garlic and cook until onions just begin to soften, approximately 3-5 minutes. Add pepper and cabbage and cook, stirring occasionally, until cabbage just begins to soften, approximately 5-7 minutes. Stir in tomato paste and all spices. Add pork back to pot, stirring to coat. Add sauerkraut and water. Lower heat. Cover pot with lid and simmer for 35 minutes until pork is tender. This was a really pleasant dish and would be especially well suited to a cold, rainy day as it’s definitely hearty comfort food. It’s also always great to add to the list of one pot dishes so there’s less cleanup later. I love the way caraway and cabbage taste together. The two flavors are natural partners, much like Christina Aguilera and Blake Shelton dueting on the song, Just a Fool from her new album available today (yup I went there again). I also really liked the play of the fresh cabbage and the sauerkraut. The fresh cabbage retains just a bit of its coolness and crunch which cut through the tang of the nice soft sauerkraut. The only thing I’d do differently if I made this again is to double the spices. It’s Day #2 in my Ten Days of Thanksgiving inspired by Lisa. My friends and I came to The Church of St Luke and St. Matthew at 520 Clinton St in Brooklyn ready to do whatever needed to be done including going out to the actual disaster sites. What we saw when we arrived was stunning. The church had been turned in to a massive base of operations. There was a communication center set up upstairs to field calls and emails and to communicate with those out in the field. Downstairs were the kitchens where hot meals were being prepared and lunch bags with sandwiches and snacks were being packed. When Occupy Sandy began, the day after the hurricane they were preparing 5,000 bagged lunches; they’re now up to 25,000 bagged lunches a day. The chapel on the main floor was home base for driver dispatch and donation drop off and pick up and though we had several jobs that day that’s where we spent most of our time. If you ever need your faith in humanity renewed go spend some time at one of these hubs and witness the goodness of people. There were people there of all ages, races and economic circumstances. If you came with a laptop they needed your help up in communications. You’ve got a car, great they’ll send you out in the field; kitchen experience, head downstairs and have at it. If you show up they will find you a way to help. One of the sweetest things I saw was the huge number of parents who came with their little ones. There were two main projects for kids. The really little ones were given crayons and paper to make cards for people affected by the storm. The slightly older ones were put to work making sandwiches and packing lunches. Last time I posted that I was thankful for all of the amazing people around the country who were doing all they could to help us out. Today I am grateful for my own community, right here. I’m thankful that people can put aside politics and any other disagreements and just help. I have always believed that New York and New Jersey are filled with amazing people who will always be there for a neighbor in need and Sunday’s experience just hammered that home. So thank you to my neighbors, I am awed and humbled by all that you’re doing.